Last year The Times newspaper published a map of the most dangerous road junctions for cycle collisions in the UK. At the top of this list was Stratford High Street where it meets the Warton Road junction, which is where the extension to Cycle Superhighway 2 was built in 2013. Various vocal opponents of segregated cycle facilities used this article as an opportunity to criticise the route, with Hackney councillor Vincent Stops the most prominent at doing so again and again. This was despite it repeatedly being pointed out to him that this section is actually not segregated at all and had been widely criticised after the CS2 extension was opened by both cycle campaigners and the London Cycling Campaign. What I have not yet seen Vincent Stops do is mention that, according to the same report, the seventh most dangerous junction in the UK for cycling is located in the borough of Hackney and is on the route of the soon-to-be-renamed Cycle Superhighway 1, at the junction of Pitfield Street, Hyde Road, Whitmore Road and Hoxton Street. This road junction was a roundabout for many years and the Hackney Cycling campaign were calling for it to be turned back into a crossroads as far back as 2005, with nearly £600,000 spent doing so in 2011. This being a Hackney Council led scheme the carriageway was, despite the space available and both roads assigned as cycle routes, not provided with any dedicated cycle infrastructure and was rebuilt as a very narrow road forcing people to adopt a 'vehicular cycling' middle-of-the-road position, with the remodelled pavements becoming absolutely bloody enormous. Even though this is a junction where the LCN+ cycle route 10 and LCN+ cycle route 16 cross there are no restrictions for motor traffic on all four roads in the immediate area so it is a very busy junction with motor traffic continually crossing all four arms of the junction. It is especially busy with cars going east-west, using this as a rat run between the A10 and New North Road, whilst most cyclists want to go north-south using this as a route between the North of the borough and Central London. The changes were widely criticised at the time with accusations that the junction was now more dangerous and a collision occurring within a month of the new layout opening with the local tenants association blaming the new layout for people jumping the give way and shooting across the junction. This is backed up by the person who leaves a comment at the end of this Loving Dalston piece with similar remarks from another person here. I have to agree and have witnessed several near collisions right in front of me whilst cycling along here and I was also struck by a car myself recently (although at very low speed) who failed to give way as I travelled north to pick my daughter up from Nursery. Confirming, if I ever needed it to be, that I will never, ever cycle along Cycle Superhighway 1 with her, as this road is simply far too dangerous. Hackney Council recently responded to a freedom of information request on road traffic collisions in the borough and the data provided confirms The Times report about this being the most dangerous junction for people cycling in Hackney. In the three year period from the beginning of 2012 (nearly a year after the roundabout was removed) to the end of 2014 there were 14 casualties for cyclists at this junction, the highest amount by quite some distance, more than double the amount of cycling casualties than any other junction in the borough. It was also the fourth most dangerous junction in the entire borough for collisions of all types. The chair of the Hackney Cycling Campaign at the time of these changes, Trevor Parsons, responded to criticism of this scheme in a local councillors blog defending this scheme, although with some odd comments about a bakery and a pub previously being at this location. Several local residents and users of this junction responded that in their opinion this scheme did not make conditions safer at all. The same junction in Victorian times when it wasn't even a crossroads. It had a pub, a post office and a bakery but, more importantly for road safety, no white vans racing through at high speed. In Hackney we think about cycle journeys, not cycle routes.The changes at Britannia Roundabout on Pitfield Street demonstrates the philosophy better than most. It's a scheme that was 100% driven by the Hackney Cyclists group, but 95% of the benefits accrue to the local residents and pedestrians in terms of a better street environment. So, 100% delivered by the local cycling campaign group and the result is a junction which is the more than twice as dangerous for people cycling than any other junction in the borough and the seventh most dangerous junction to cycle through in the entire United Kingdom. In the draft vision for Shoreditch the call was for the Old Street roundabout to be replaced by a crossroads, something which will not now happen although it will still be significantly improved with more space for pedestrians and safe protected cycle tracks through it. Whilst the vision talks about 'new development on the corners of the crossroads', 'new public space', demolishing 'poor quality buildings' and even narrowing Old Street east of the crossroads to 'release more land for development' it doesn't once mention any actual provision for people cycling. Just as Trevor Parsons focuses on wider footways, trees and seating areas at the Pitfield Street crossroads it seems some cycling campaigners have public realm very high in their thoughts but don't always consider looking at creating cycle specific measures which could improve the safety of people cycling. 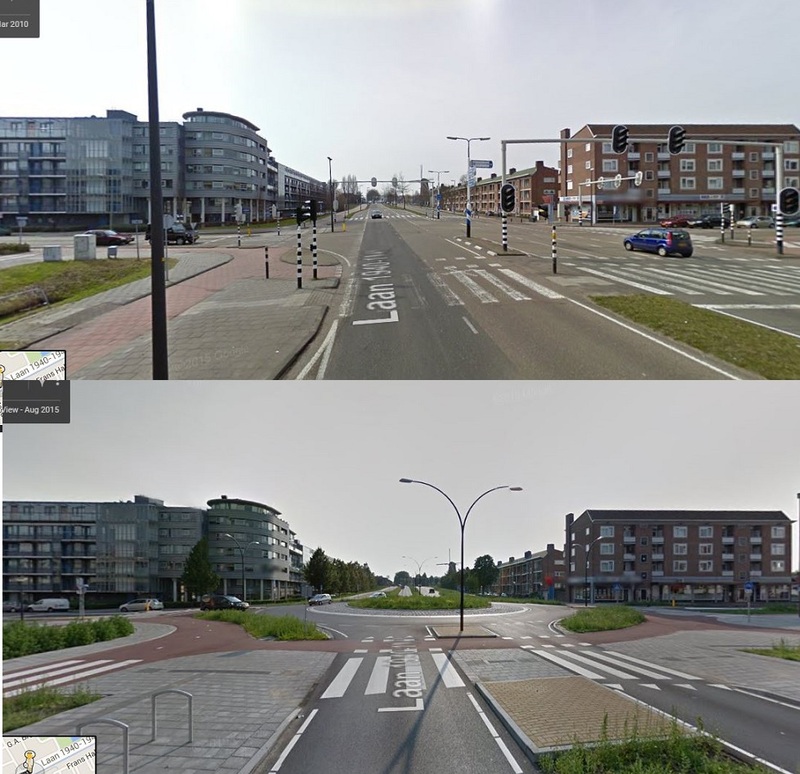 One thing that struck me during my trip to the Netherlands last year were how much of a joy it was to use roundabouts. I almost always had priority so no slowing down taking me out of my stride and I always felt safe using them. I was often surprised when using the google maps street view feature to look at junctions I had cycled on to find that many of the roundabouts I had used had recently been built to replace a crossroads. 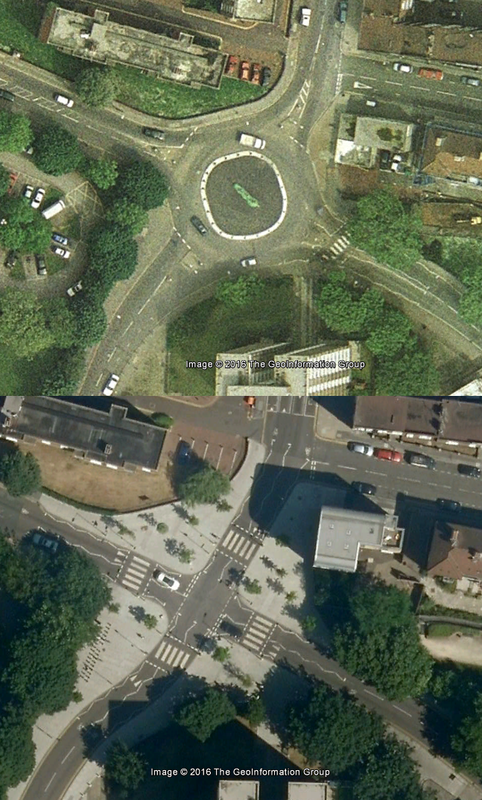 Just one junction of many I passed through that had been hugely improved by replacing the crossroads with a roundabout. Priority and safe conditions for people walking and cycling, improved public realm and five lanes of motor traffic reduced to two lanes. Dedicated cycle tracks with priority for pedestrians and cyclists across all of the arms of the roundabout at all times, with single exit and entrance for vehicles on each arm as well. This would have been a much safer design for this junction, particularly as both roads are cycle routes and one of them a "cycle superhighway". We could have even kept the sculpture in the middle of the roundabout! A cycle track in Amsterdam at a junction I stopped at last year, a similar treatment would have been a much better solution at a roundabout at Pitfield Street. Clear priority for pedestrians and a level, easy to cross cycle track . No trip hazards here! Proposals in some of the draft vision for Hackney documents and some of the "ward asks" from the Hackney Cycling Campaign in 2014 are for roundabouts to be replaced by crossroads and turning the Lea Bridge Roundabout into a signalled crossroads may well be a big improvement, as long as it has protected space for cycling. 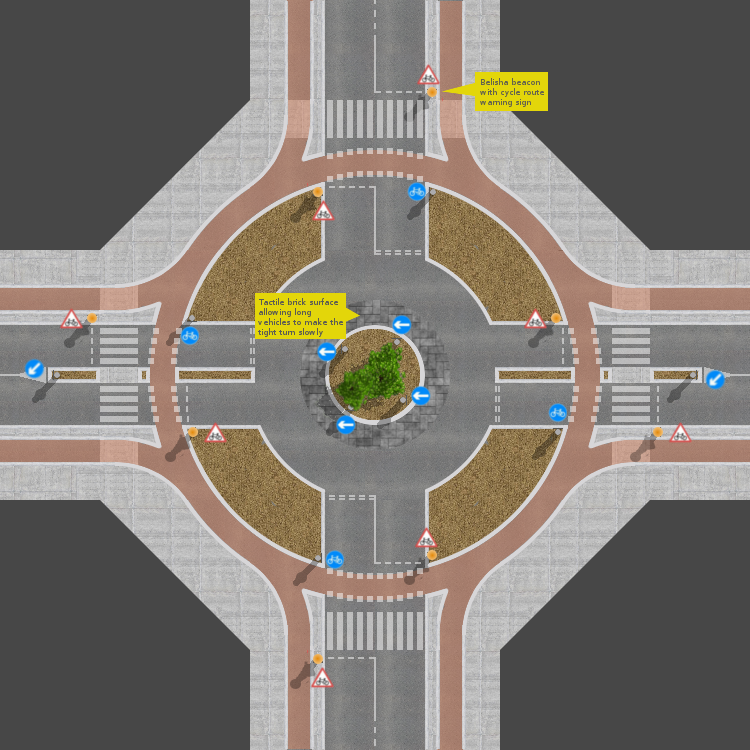 However in other areas it may well be more beneficial to either keep a redesigned roundabout in place or even convert some crossroads into roundabouts, based on classic Dutch roundabout design, to increase safety for people walking and cycling whilst also improving public realm. One thing the Hackney cycling campaign should never do again is campaign to spend over half a million pounds replacing a busy junction without ensuring safety for cyclists is a priority, especially if space is available for dedicated cycle tracks. Simply calling for roundabouts to be removed is not an adequate measure if the junction is to remain the most dangerous junction in the borough and in the top ten of the most dangerous junctions for people on bikes in the UK.